With WWDC 2013 on the way, many tech enthusiasts want to see the announcement of not only iOS7, but also the iPhone 5S or iPhone 6. CNET’s Josh Lowensohn, however, believes that there will be no hardware announcements at WWDC this coming Monday, on both the iPhone and iPad fronts. Rather, Apple’s new Macs and the “Ive-ian” iOS7 are the best of the show. While I have said in a prior article that the iPhone 5S may be nothing more than an iPhone 5-like device with 128GB of increased memory storage, new predictions from analyst company Citi Research confirm Lowensohn’s statement — not to mention the fact that the iPhone 5S may be more of a transformation than previously believed. According to Citi Research, the iPhone 6 is likely to emerge in Q1 2014 with a larger display. It seems likely that this date for the arrival of the iPhone 6 conflicts with earlier reports about the iPhone 6 release date. Why the iPhone 6 Release Date Change? The production of the upcoming iPhone 5S has been delayed by two to four weeks. And while this does not preclude a September iPhone 5S launch date, we suspect volumes in September may consequently be challenged…We expect a 4.8 [inch] screen iPhone 6 to be launched in 1Q14. Citi Research believes that the iPhone 5S may be postponed until September, indicating that there will be no such hardware announcement at WWDC 2013. 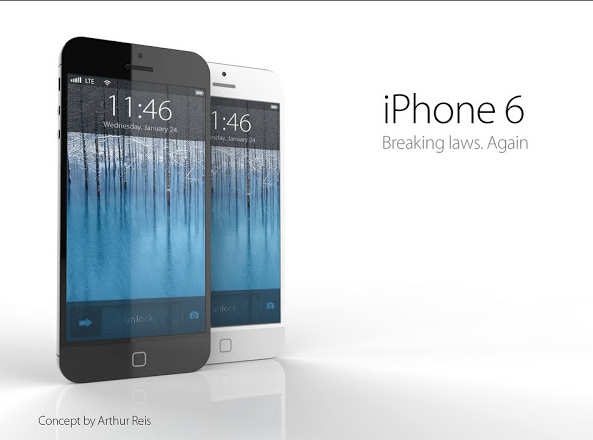 In addition, the iPhone 6 will have a 4.8-inch screen when it is released in late winter 2013/early Spring 2014. We do not know why the iPhone 5S has been delayed, but iOS7 may be the reason. After all, Mac OS engineers were pulled from Mac OS work to help with the iOS7 redesign. iOS7 is certain to emerge at WWDC, according to the new banner with the number “7” that has been placed at the Moscone Center (the setting of Monday’s WWDC 2013 announcement). If Apple is redesigning the iPhone in the iPhone 5S, and not producing a 128GB version of the iPhone 5, then we presume that time will be needed to finish the iPhone 5S transformations. Additionally, Apple just secured a deal with Sony to inaugurate its iRadio service — a feature that is certain to be announced at WWDC. With Apple’s rush to get iOS7 ready, along with its “Friday rush” to secure all partners in its iRadio service, it seems as though Apple has rushed to do too many things all at once. The iPhone 5S may wait until September. While Citi Research may have good reason to write its investors and relay the above news, it may or may not be true. While Apple has rushed some things to prepare for WWDC 2013, we’ve not heard anything official from Apple, unless you count Tim Cook’s words that “nothing new will arrive until Fall.” This may mean that the iPhone 5S will have a September date. At the same time, the iPhone 5S may still be nothing more than a memory storage increase version of the iPhone 5. The new SIM card tray colors, as well as photos showingchanges with the iPhone home button, may indicate that the iPhone 6 is the most prioritized project of Apple right now. Considering that it will be September before iPhone users receive the iOS7 upgrade, it may be safe to say that the iPhone 5S will sell a larger storage amount until the iPhone 6 release this Fall. What are your thoughts on Citi’s predictions? Do you think that the iPhone 6 could be delayed until 2014, or do you think that Citi’s got it wrong and the iPhone 6 will be announced this Fall? Let us know what you think in the comments below.